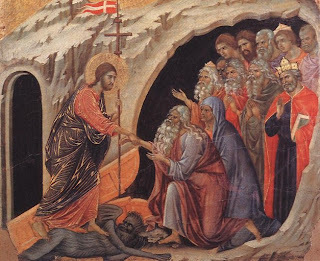 Today Brant and I were on Catholic Answers Radio talking about Holy Saturday and the line in the Apostles' Creed which states that Jesus "descended into hell." (Hopefully the show taught about the subject and was not an experience of it!) Anyone interested can hear it on Catholic Answers' website tomorrow when it will be available as a podcast. Just click here and then click on the 4pm Monday slot (you'll see our names). For more information on Jesus' Descent into Hell see 1 Peter 3:18-21, Ephesians 4:8-10, the treatment in Thomas Aquinas' Summa Theologica IIIa, q. 52 (the third Summa citation in three posts! ), the Catechism of the Catholic Church 631-637, and the Catechism of the Council of Trent, art. 5. St. Irenaeus, Against Heresies 5, 31, 2 (c. 180 A.D.): "If, then, the Lord observed the law of the dead, that He might become the first-begotten from the dead, and tarried until the third day “in the lower parts of the earth" [Eph 4:9] then afterwards rising in the flesh, so that He even showed the print of the nails to His disciples, He thus ascended to the Father;—[if all these things occurred, I say], how must these men not be put to confusion, who allege that “the lower parts” refer to this world of ours, but that their inner man, leaving the body here, ascends into the super-celestial place? For as the Lord “went away in the midst of the shadow of death,” [Ps 23:4] where the souls of the dead were, yet afterwards arose in the body, and after the resurrection was taken up [into heaven], it is manifest that the souls of His disciples also, upon whose account the Lord underwent these things, shall go away into the invisible place allotted to them by God, and there remain until the resurrection, awaiting that event..."
Tertullian, A Treatise on the Soul, 60 (c. 197-220 A.D.): ... we read that Christ in His death spent three days in the heart of the earth [cf. Matt 12:40] that is, in the secret inner recess which is hidden in the earth, and enclosed by the earth, and superimposed on the abysmal depths which lie still lower down. Now although Christ is God, yet, being also man, “He died according to the Scriptures,” [ and “according to the same Scriptures was buried” [1 Cor 15:4]. With the same law of His being He fully complied, by remaining in Hades in the form and condition of a dead man; nor did He ascend into the heights of heaven before descending into the lower parts of the earth, that He might there make the patriarchs and prophets partakers of Himself." 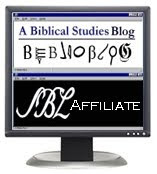 It is also found in Melito of Sardis, the Odes of Solomon, Cyril of Jerusalem, and others. For a number of citations and a look at the iconography associated with the Descent into Hell, go to the Australian E-Journal of Theology 7 (2006). I also recommend the audio set of Brant Pitre's excellent lecture series, Life After Death: The Seven Last Things. I caught the first half-hour of Catholic Answers on Living Bread Radio, while on my drive into work this morning. I enjoyed the portions that I heard. You guys have way too much fun! : ) God Bless and I'll be hearing the rest of the show as I'm subscribed to the podcast. I rather enjoyed Cardinal Ratzinger's treatment of the subject in INTRODUCTION TO CHRISTIANITY, pgs 293-301. I like the icon of Jesus Harrowing Sheol, yanking Adam and Eve up out of their graves. I actually wrote a long thing, sort of a brainstorm of ideas for a movie or play, the Gospel According to the Captive Spirits in Prison. It would make a great Easter Saturday play. I workshopped it on the CA forums and got good feedback. Which leads me to the thought of the beginning of Sheol...Abel must have felt terrified and alone, being the first one there all by himself. Hmmm. New Scott Hahn book--Best Cover Ever! A Biblical Basis For Mary's Perpetual Virginity? News Flash: Moses Was A Hippie?